Cross Timbers Youth Membership is down 13.3 % compared to last year. Please turn in any membership apps / register youth at recharter on Dec. 12. Boy Scout Camping was down again this year, with less than half of eligible scouts going to summer camp or high adventure bases. Please record your Community service hours with Council Service Center if you are not associated with a unit. Unit contacts by Commissioners: currently 34% Can we reach at least 45% by end of year? Are all visits being logged? Direct Leader training: Currently at 47%, above the Council average of 44%, (Thank you Richard and training staff) Would be great to reach 60% by end of year with new leaders completing online training and getting it recorded. 425 Eagle Scouts as of end of October, Council wide. The District Nominating Committee has been approved and will begin filling open positions for the 2018-2019 year. If you are interested in serving on a District Committee please contact the District Chair via the District website contact form. Please consider nominating someone who might be worthy of the National Outstanding Eagle Scout Award! Please consider nominating someone who might be worthy of the National Outstanding Eagle Scout Award! Please distribute or work with your Commissioner Corps to distribute the attached application within your District. Applications are due back to the Council Office by December 15th. I am confident that we know people worthy of this recognition. • Individuals who have attained prominence at the state or regional level in their profession or avocation—an avocation being any activity including, but not limited to, athletics, hobbies, collecting, outdoor adventure, and record-setting activities. 2201 W Park Row Dr. 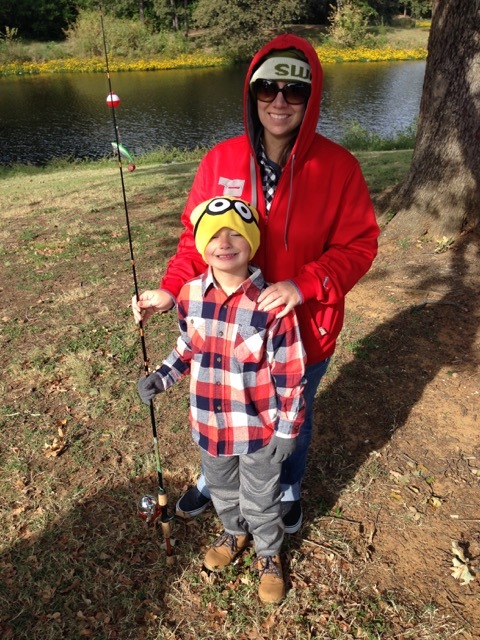 Pack 82 Cub Scout Samuel Cedars and his mom, Rachel had a great morning at the Cross Timbers Fishing Derby for new Scouts, Oct 28th. They spent the entire morning working their fishing tackle at the Randol Mill Park Pond. They also enjoyed meeting the geese and ducks. They were fueled by the snacks provided by the District Committee. Thanks to Activities Chair Chris Gaston and Membership DE Chris Bankus for making this event a success. The National Executive Board recently passed a resolution allowing for the full family to enjoy the character and leadership program of the BSA. This begins in the fall of 2018. What to do with your Popcorn Money? Our Popcorn campaign is coming to a close. There are many program ideas to do that will excite and engage your members. Look at Boy's Life for ideas. Let your imaginations run free. 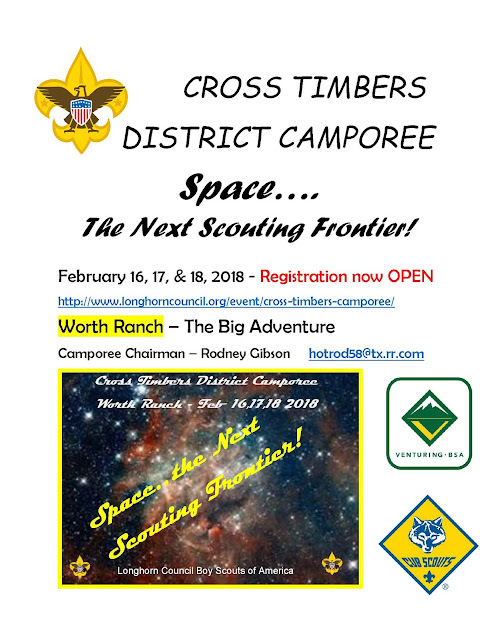 You might try the Chisholm Trail Adventure at Sid Richardson Scout Ranch…. there is no similar program in the Nation. See the www.longhorncouncil.org for more information. Besides program ideas, some have questions regarding 'scout accounts'. Scout accounts per se are not allowed by regulation from the IRS. However, BSA recognizes that product sale campaigns are 'part' of the program. It teaches values related to thrifty, paying your own way, and the skills of goal and financial management. It is a great communications and confidence builder. The National Boy Scouts has provided an interpretation for you. The money is controlled by the unit committee and may be used to reduce the costs of scouting from camp fees to equipment as controlled and authorized by the unit committee. The top 100 selling youth and a guest will get a special showing of the new Star Wars movie on December 16th. This is a premier showing! It will not be available in theaters yet.. This is a special opportunity being paid for by our popcorn vendor—Trails End Popcorn. To be eligible, you will need to submit your Scouts' total sales into the form on scoutfund.net/star-wars. Every Monday beginning in November, a real time tracker will be on scoutfund.net for everyone to see the top 100. At the conclusion of the campaign, if your Scout is one of the winners, you will receive a personal invitation to the event. The Longhorn Scout Shops are providing an opportunity for the Scouting community to help local Scout members who may be in need of uniforms and uniform items. We will keep the name of the individual(s) confidential. Only the store staff will have access to the Scout's name and your contact information. A code will be issued that will match a card in the safe that will have your contact information, so as the donations are collected store staff will contact you so arrangements for pickup can be made. We need your assistance to make this project a success. Visit a ScoutShop and fill out a form for every scout who would benefit from donations from the Scouting community to complete their full uniform. 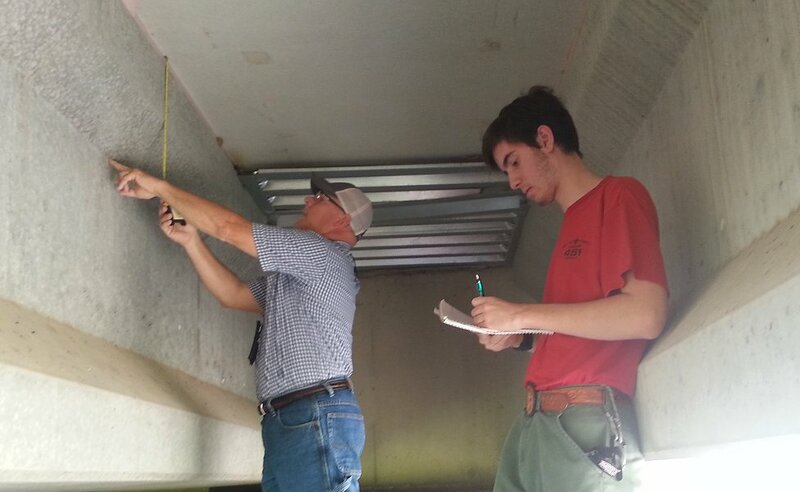 Thanks to the Eagle Scout project created by Stephen Lampe of Boy Scout Troop 451, Flower Mound has a Bat Habitat near the town's Water Plant. Friends of Scouting Campaigns are beginning. The personal donation you give to the Longhorn Council is tax deductible gift that is multiplied to recruit more boys, provide a subsidy for year round camping, buy liability insurance to cover adults, chartered organizations, and all Scouters from harm. Look for more information as the campaigns are started. Your gift makes great things happen. A workshop for youth 15yrs and older, to teach them how to use tools, build a camp shelter and learn a skill for a lifetime. The course will be limited to 10 youth. Ever Want to Throw a Telephone Pole? A Boulder? A Battleaxe? Slay a Pumpkin with a Sword? Now's your chance. Get ready for Highland Games! Activities include 8 bounce houses, BB, archery, jousting, face painting, climbing wall, leather crafts, monkey bridges, bowling, challenge games, chariot racing, soccer, and lots of new games! Have YOU registered yet? Online registration ENDS on 11/10/17...so hurry! Don't forget, some class sizes are limited...you don't want to miss out. The Master Camp Plan calls for bringing electricity to each campsite and program shelters to allow leaders and youth to utilize electronic learning tools. This will also give volunteer leaders the ability to stay connected to their work while away serving their Scouting Unit.